INFID, NusaNet, and its advocacy network | aha! International NGO Forum on Indonesian Development (INFID) was initially formed in June 1985, under the name of INGI (Inter-NGO Conference on IGGI Matters), by several Indonesian NGOs (YLBHI, WALHI and Sekretariat Bina Desa) in co-operation with a number of Dutch NGOs (NOVIB, CEBEMO, HIVOS and ICCO). INGI was (and INFID is) an open and pluralistic network of 60 NGOs based in Indonesia and 40 NGOs based in other countries mostly belong to IGGI (Inter Governmental Group for Indonesia, previously – now CGI, Consultative Group for Indonesia—a consortium of donor countries). INGI transformed into INFID in 1992, following the dismissal of IGGI by the Indonesian government and the formation of the CGI (Hadiwinata, 2003:98-100). Since its establishment INFID has been providing input and recommendations on development issues to the donor countries of Indonesia by monitoring the use of bilateral and multilateral loans as well as the pledging sessions for new loans. INFID aims to facilitate the communication between Indonesian NGOs and their international partners to promote the policy of eradicating structural poverty and to build the capacity to improve the livelihood of the poor and the oppressed in Indonesia. In the Indonesian social movement, INFID is seen as one of the most respected advocacy network NGOs. With its Indonesian secretariat employing 25 full-time staff and 5 part-time staff, and managing several billions IDR (or hundred thousands USD) annually to maintain the network of 100 organisations both national and international, INFID is no doubt seen by others as a big advocacy NGO in Indonesia. INFID might be the first NGO that adopted the Internet in Indonesia in the early 1990s. When most of Indonesian NGOs –and arguably even business firms and state agencies—had possibly never heard about the technology, INFID had already considered the idea to be an Internet Service Provider (ISP) for NGOs and other civic communities. INFID introduced NusaNet in early 1994 –an idea which was largely driven by the government’s repressive conduct and surveillance towards civil society and the need for safer communication and more effective networking among NGOs. Backed by its international donors, INFID decided to invest quite a large amount of money to build the infrastructure in order to provide an Internet connection to Indonesian CSOs. Although the service that NusaNet provided was very simple –dial-up access at 9.6Kbps and encrypted email exchange through generic addresses “@nusa.or.id”—it helped many organisations, groups and activists to learn about the technology. 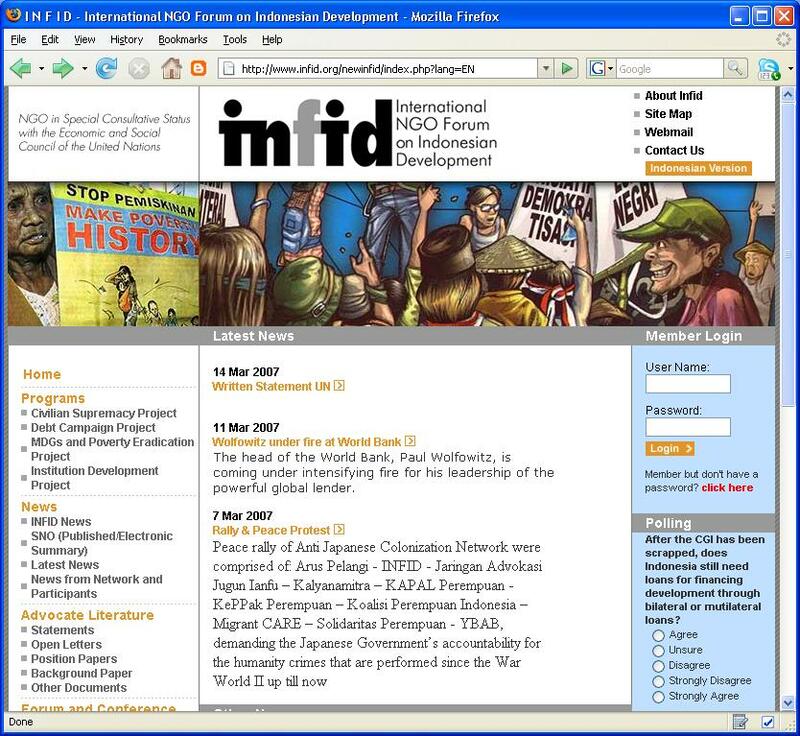 By the end of 1996 and in early 1997, a considerable number of Indonesian advocacy NGOs and many pro-democracy activists had been connected to the Internet via INFID’s NusaNet, which was also considered safer than commercial ISPs which could be easily interfered by the government’s military intelligence. NusaNet has certainly played an important part in the episode of preparing and conditioning NGOs for the Indonesian reform movement in 1998; some scholars even claimed the reform would be impossible had the Internet been absent in the movement (Hill and Sen, 2000; Lim, 2002; 2003d; 2004a). For INFID, the main motive for adopting the Internet was certainly not only to use it as a safer and quicker communication tool but also as a means for advocacy and for bringing about wider democracy, by “linking pro-democracy actors in the [Inter]net to discuss potential actions, to prepare and to make it happen in the field” (Susilo, interview, 1/12/2005). The motives remain unchanged until now. Although in the post-reform period the NusaNet project ceased to exist due to the shift of financial priority (which simply made the provider unable to keep up with the technological development) and the fact that commercial ISPs were widely available, INFID keeps using the Internet in a strategic way for its strategic purposes. Important gift for anyone who needs backlinks for no charge. Anyone want free one way backlinks for their webite? I figured I might distribute some good info I found a little while ago. Free backlinks for your blog. I have been using this for my websites and it absolutely works great! Just click my name to get what I mean. Not peddling anything, it’s completely free and it works.